Venezuela’s refugee crisis is metastasizing. According to the United Nations, 5,000 Venezuelans have fled to Curacao, 20,000 to Aruba, 30,000 to Brazil, 40,000 to Trinidad and Tobago, and more than 600,000 to Colombia. In times past, the U.S. has led in responding to exoduses sparked by political or humanitarian crises. In 1980, it welcomed 125,000 Cubans fleeing in what became known as the Mariel Boatlift. Nearly two decades later, it provided respite for tens of thousands of Hondurans and Nicaraguans in the wake of Hurricane Mitch, and more than a quarter-million Salvadorans after a 2001 earthquake. Much as the region has not always welcomed some U.S. interventions — think Grenada in 1983, Panama in 1989 and Central America throughout the 1980s — when crises arise, Latin American nations still look north. Yet although the U.S. has put pressure on Venezuela to restore its democracy, the burden of coping with the implosion of what used to be Latin America’s richest nation has fallen most heavily on its immediate neighbors. They can’t afford to wait for a distracted and less benevolent U.S. to do the right thing. Instead, for their immediate and collective future, they must forge a regional response to what has become the hemisphere’s greatest humanitarian crisis. Despite touting its “year of engagement” with Latin America and dredging up unfortunate echoes of the Monroe Doctrine, the Trump administration seems to have little desire to lead in the Americas — at least on the region’s most pressing issues. It pulled out of the Trans-Pacific Partnership, leaving Canada, Chile, Mexico and Peru bereft, and has repeatedly threatened to end the North American Free Trade Agreement. It walked away from the Paris climate accord, which Latin American nations widely supported, and rolled back the opening with Cuba. As for Latin Americans themselves, the U.S. is more likely to kick them out or wall them off than extend its welcome mat. It recently ended Temporary Protected Status for some 200,000 Salvadorans and 60,000 Haitians (the fate of an additional 87,000 Hondurans is unclear), and looks to begin deporting some 700,000 Mexican and Central American “Dreamers,” undocumented immigrants brought to the U.S. as kids. Not only has it halved the number of spots open to refugees, it is speeding up asylum applications for recent applicants — a decision that will likely result in the rapid repatriation of many Venezuelan asylum seekers who would otherwise have been able to work while waiting for the processing of their cases. Top U.S. diplomats have called out Venezuela’s humanitarian plight and human rights abuses. But on his five-country trip to the region, Secretary of State Rex Tillerson focused more on building support for new sanctions than on addressing this more immediate catastrophe. And while the Trump administration has offered aid to Venezuela — which the Maduro government has repeatedly rejected — the countries receiving Venezuela’s refugees have been largely left to deal on their own. Colombia, bearing the heaviest burden, has granted its own version of temporary protected status to some 150,000 Venezuelans, even as it has cut back on new visas, beefed up military patrols to stanch illegal crossings, and visited refugee camps in Turkey to look for best practices. Brazil declared a state of emergency in border state Roraima, doubling troops and ramping up basic services for the tens of thousands of newcomers. And while often not the first stop for those fleeing, Peru and Argentina have somewhat loosened visa requirements, enabling more Venezuelan migrants to stay and work. These piecemeal responses won’t be enough, however. The flood of people is already overwhelming border economies, schools, health systems and basic shelter in Colombia, Brazil and even Ecuador. Venezuela’s Caribbean neighbors, many with weak institutions and still recovering from last year’s hurricanes, are ill-equipped to meet such new challenges. And those fleeing are vulnerable to human trafficking and extortion, providing fodder for transnational drug and criminal organizations. The surge threatens to shift politics in this year of the Latin American election, when nearly two out of every three voters heads to the polls to elect a new president. Unfortunately, coordination among Latin American nations won’t be easy. Despite much cooperative rhetoric and nearly two dozen regional economic and diplomatic bodies, the countries and their foreign policy efforts remain quite solitary. There is no NATO, no true customs union, and so far no regional body able and willing to act decisively. Instead, and in part due to the weight and leadership of the giant to the north, most every country has historically adopted a non-intervention mantra toward its neighbors. Still, Latin American nations today differ from their more passive past incarnations. With a combined GDP of more than $5 trillion, and two of the world’s 15 biggest economies, the region’s increasing economic heft means more resources are available to address the costs of such a crisis. Mexico recently joined the growing roster of Latin American nations that contribute to peacekeeping missions. Nearly all the countries are democratic, with most committed to spreading these ideals broadly. 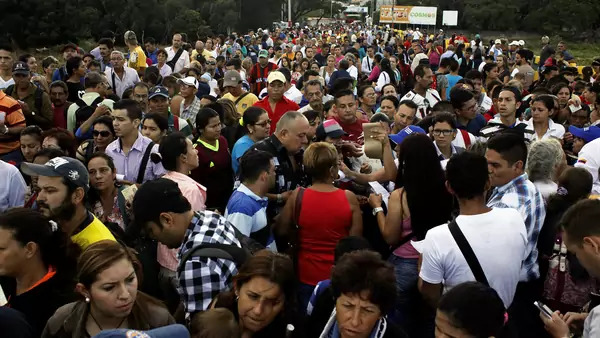 And the spillover effects of the Venezuelan crisis on their own voting populations have created a shared urgency. To assuage the humanitarian crisis will require coordinating and funding massive efforts to bring food, water, shelter and medicine to those already displaced and the many more to come. It will mean creating schools (one-half of refugees are usually children), building infrastructure, and finding ways to enable the exiled to make a living. And it will mean getting more nations to take in those forced into exile, relieving the crush on Venezuela’s immediate neighbors. To galvanize a response, the region’s leaders should turn to the Inter-American Development Bank and World Bank to fast-track cheap loans for refugee-focused infrastructure. They should pressure China, which covets not only Latin America’s raw materials but its growing consumer markets, both to support that effort and to make clear to Venezuela that its conduct must change. And they should forcefully call out Cuba, which has supported and advised President Nicolas Maduro as he dismantled his country’s democracy and engineered its economic and financial self-destruction. Latin America doesn’t need a new mechanism to pursue this more cohesive and comprehensive response — the recently created 14-country Lima group could suffice, and older diplomatic bodies desperate for a mission abound. Its nations need only to summon the will and leadership to pick up the regional humanitarian mantle. If they do so, it may then be the U.S.’s turn to follow.